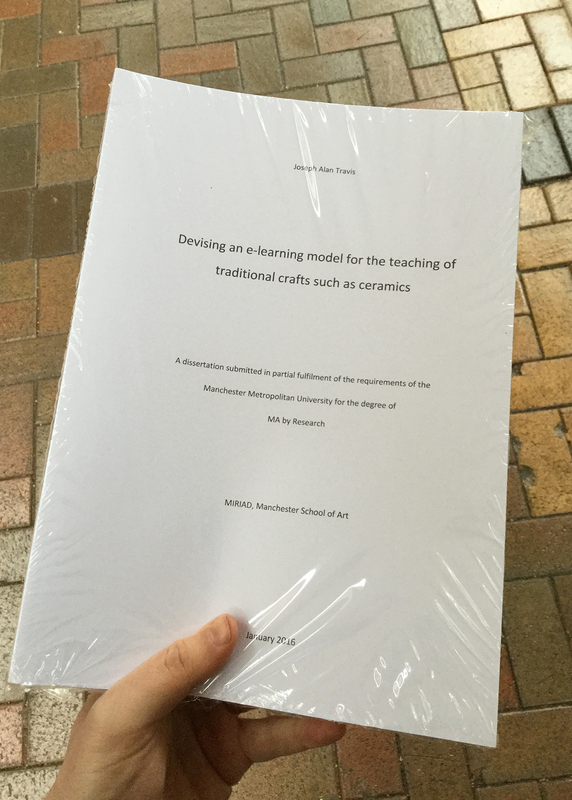 Devising an e-learning model for the teaching of traditional crafts such as ceramics. In January I submitted my dissertation for my Master’s research project. I am surprised by how long the process of writing up can take, but a lot of it is editing and re-editing to ensure I said the right things with the right tone. I am glad the writing process is over, but now we are on the worse part of the process, waiting. I am waiting for my verbal examination, which is a presentation and an interview based on the work I submitted. The thing is I don’t know when it will be apart from mid-to-late March and this is the hardest thing. So at the moment I am doing what I do after every major project I am organising my house, redecorating, laying carpets and just generally trying to get on top of jobs that got put on the back burner due to being busy with my research project. At the same time I am reviewing my previous projects to see what worked, what I enjoyed and trying to plan the next projects. While I wait I plan kilns, I draw pots that may never happen, I dream of what could enter the melting pot of my work and where I may take this next. But in the end I don’t really wish to commit to anything larger than picking a new colour for the kitchen walls as at some point very suddenly I will have to prepare my presentation and get up in front of two examiners and explain to them what different my research makes. So reader, what do you do when a major project is finished? This entry was posted in Learning, Meerkat, Research and tagged art school, ceramics, decorating, dissertation, hands on thinking, learning, masters, planning, pottery, Research, Simpsons. Bookmark the permalink.